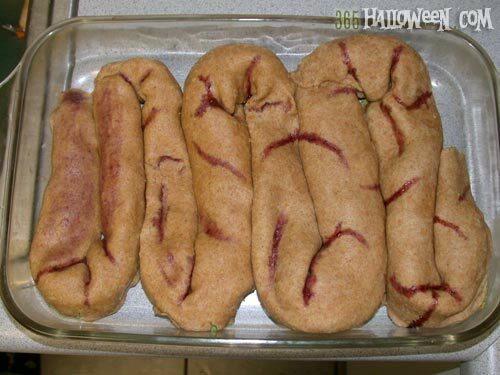 When you’re hungering for a hearty Halloween dinner recipe, slice yourself off some “stuffed intestines”. If you’re a fan of pot pies- and who isn’t- you’ll love the warm flaky crust of the “intestines” and the colorful creamy vegetable stuffing inside. Like most of our recipes, this one qualifies as “healthy Halloween” eats so you can feel good about loading up before you head out for Halloween mischief. Like many delicious recipes, this one is rather elastic in it’s ingredient listings and amounts. You could easily just use your favorite pie crust recipe, any combination of veggies, spices, and sauce for the filling, and pop it in the oven. That’s one of the best parts about Halloween anyway: getting crazy creative! If you’d like to try and replicate the mouth watering orange-and-black stuffed intestines that we made, look below for recipe and instructions. There are a few steps, so this makes an excellent 2 person recipe: you can tag-team the various aspects and not be in the kitchen for hours on end. 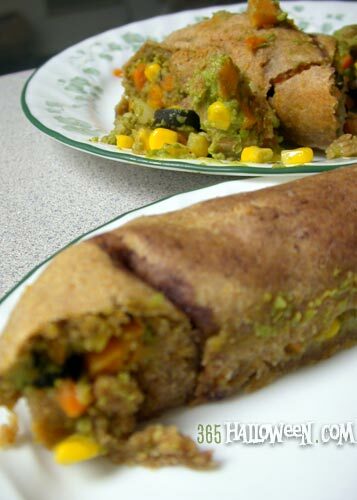 Now it’s time to get your vegetable filling ready. For color (and flavor) reasons, we chose the following combo, but you can pick any veggies that you like. 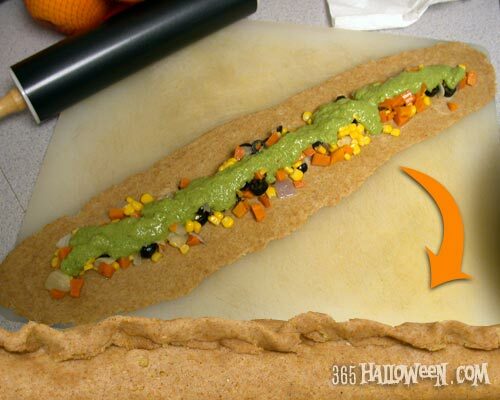 Check out our article on colorful Halloween foods for ideas on ingredient substitutions. Think brief here, because we want these veggies to be lightly done; they will further cook in the oven. In a big skillet, lightly fry up your onions in some oil. Remove from pan and set aside. Add some more oil and fry up the yam cubes until you can almost stick a fork through them. 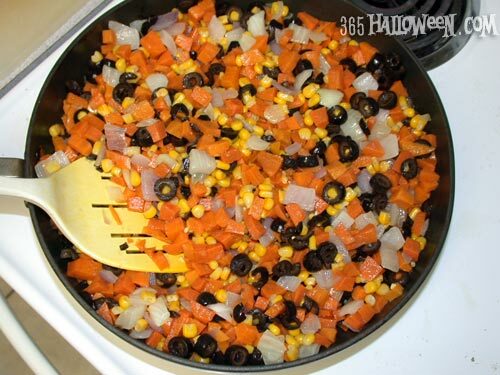 Lower heat to medium, and add the onions back in along with the corn and olives. Add some spices to taste. These spices can compliment the ones in the Green Guts Filling, or just be more of the same. Now it’s time to assemble everything. 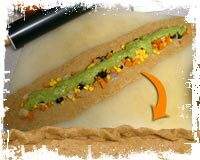 Take your dough strips one at a time, and lay out a thin line of veggie filling. Top that with a coating of green guts filling. 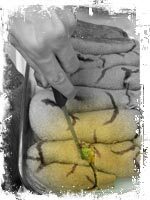 Then carefully bring the edges of the dough together and pinch them shut, sealing everything inside like a snake who just had a big meal. Yum! In a big glass casserole pan (no need to grease it), very carefully lower your first filled intestine at the bottom of the pan. 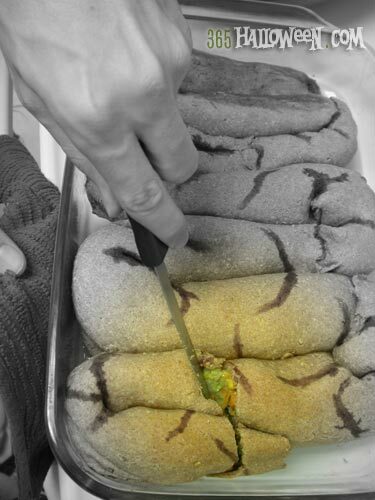 Roll it until the seams are hidden underneath, and start to snake the tube into an S shape like real intestines. An extra set of hands to brace the heavy-laden intestinal tube will be helpful! Continue on with the other 3 tubes, and assemble them all together in the pan. Pinch and fold and generally manhandle the seams in-between the tubes so you make them blend together, appearing as though it’s one continuous tube. Using your food coloring and a teeny paintbrush (super clean or brand new), apply “veins” and other anatomical markings to make the intestines appear less like dough and more like a spooky Halloween recipe worth showing off. Pop that bad boy in a 375 degree oven for about 30 minutes, or until the crust is golden brown. Make like a zombie and proceed to chomp down on those intestines! 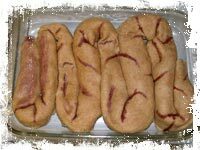 create your own Stuffed Intestines Recipe. Subscribe to comments with RSS or TrackBack to 'Stuffed Intestines Recipe'. I am so excited to find you 365 HALLOWEEN!!! Over here in Australia, Halloween isn’t ‘massive’ however there is quite a following. 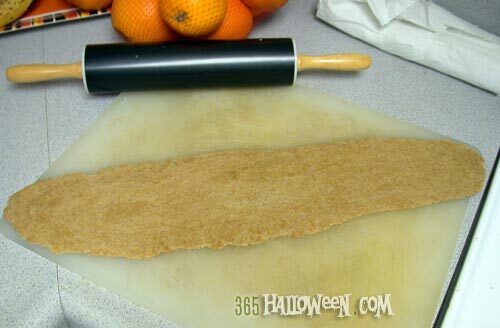 I am going to my first Halloween Party and and going to bake ‘intestines’ gluten free and vegan style – can’t wait!!!! Will let you know how it goes. THANKS 365 HALLOWEEN!!!! I made this for the company halloween potluck & won best dish – thanks! I found the dough to be too wet & needed to add a lot of flour while kneading, also I ended up with way more filling than dough so it was “Baked Burst Intestines” with the extra filling taking up half the pan. It was scarfed down too – & nobody else at work is vegan! I made this last year for my Halloween party (I’m the only vegan) and my friends were talking about how great it was when I was planning the party for this year – so of course I’m going to make it again!! I am going to make the intestine this weekend for company, but plan to stuff it with a delicious, slow-cooked vegetarian chili! Looks great! For the apple pie version someone mentioned (awesome idea), you can also use whole wheat pastry flour, essentially white wheat. Works better for sweet things than regular whole wheat, in my experience anyway. Can’t wait to try this for my party this year! Thanks. Couldn’t you really make it look authentic and make a chocolate filling??? 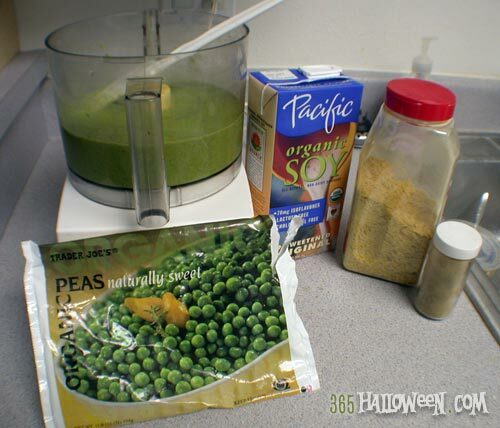 365 Halloween Response: Too gross for Halloween? Never. Someone else mentioned making an apple pie filling set of stuffed intestines, so a chocolate-y filling sounds like a sweet, yet inherently gross, alternative. Pair it with the Kitty Litter Cake and you’re all set for a night of nasty nibbles. Just as an alternative, I made pie crust and did the same thing with apple pie filling, just making the outside look like intestines, not so much the inside. But that depends on what that person ate now doesn’t it? 365 Halloween Response: Indeed! That’s a great (and delicious) idea to make a pie version of the “intestines”. The flexibility of this recipe- use whatever crust or filling you like- is one of it’s best points, eh? I think I’ll have to try a vividly colored fruit pie version myself. Maybe blueberry or strawberry? What kind of flour do you use for the crust? Whole wheat? 365 Halloween Response: Well, that’s up to you, but we favor half whole wheat and half spelt. It’s kind of our house blend. Let us know how the recipe turns out for you! 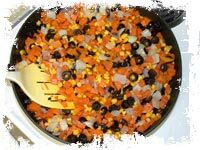 Hey All – This recipe was fantastic! My friend Michelle made this for my Halloween Vegan Potluck. It was fantastic and looked the part for Halloween! Instead of food coloring, she opted for marinara sauce, and it added the perfect touch! Thank you so much, this will add to my gruesome recipes I already have. I love the grosser the better at my parties. These kind of things make me famous for my Halloween parties. I hope everyone will enjoy. 365 Halloween Response: You’re very welcome, and do let us know how the “intestines” go over at your party. This recipe has so many possible variants, so we’d love to hear how you personalized it. And how awesome is it to be famous for making creative and creepy Halloween stuff? 😀 Keep up the good work! I’m having my first halloween party this year, I think the inspiration came from this site. I just came home with a brain “jell-” mold and I’m super excited. I’m afraid to make too much food stuff, like the guts, instead of snacks. I usually have parties with dinner, and most everyone leaves after they eat. It makes me crazy. Somehow I think if i just stick to more snacky things, people will stay longer? I’m also making punch with a big ice ring full of tarantulas. This is an awesome recipe. I’m sure it will be a huge Halloween hit! Its not often I come across anything truly unique anymore. Thank you for sharing!